About forty people gathered at Lockheed Martin for the Brandywine Peace Community’s annual Good Friday Peace Demonstration and service modeled on the traditional stations of the cross, however with readings, poetry, recordings of Dr. Martin Luther King, Jr., and music paralleling Jesus’ last steps and crucifixion with the suffering of humanity through war, social injustice, and the violation of the earth, as well as signs of hope and expressions of radical peacemaking – people facing arrest for nonviolent resistance to the criminal authority of Lockheed Martin, the world’s largest war profiteer. The emphasis at this year’s Good Friday demonstration was the multi-billion dollar role in this new era of robotic warfare and state repression by bringing something of the humanity of the victims of U.S. drone strikes to one of the largest corporations profiting from drone weapons technology and use. After reading each station and its commentary reading or piece of poetry or music (with original songs by Tom Mullian), participants would would partake in the Good Friday litany as a cross four-plus foot high cross, each with Lockheed Martin logos at the crucifixion nail points, would be hammered into the ground by the main entrance to Lockheed Martin main driveway. 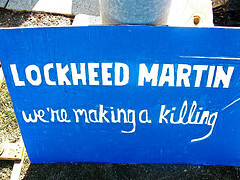 A much larger cross stood behind a large wooden sign with Lockheed Martin logo, reading “We’re Making A Killing”. At the 12th station – Jesus dies on the Cross – the tolling of our large peace bell accompanied a period of silence and the reading of names – all civilians, mostly children – of drone strikes victims in Pakistan. A group of people then with crosses, signs, and a long banner reading – Lockheed Martin War & Weapons Christ Crucified – walked into the crosswalk of the company’s wide main driveway entrance and stood as the names continued to be read. The eleven people blocking the entrance way turned and began walking, with copies of the drone strike victims, toward the main doorway. There, they had planned to read the names. As people were stopped by company security and Upper Merion police, the names of the victims could be heard as they were arrested transported to the Upper Merion police station. Eleven people were arrested and cited for disorderly conduct, and released from the police station. They are: Carroll and Joe Clay, Mary Ellen Norpel, Bernadette Cronin-Geller, Fr. Patrick Sieber, OFM, and Robert M. Smith, all from Philadelphia; Tom Mullian and Teresa Camerota, from Wyncote, PA; Paul Sheldon and Annie Geers , from Media, PA, and Tyler Sheaffer, from Sunbury, PA. 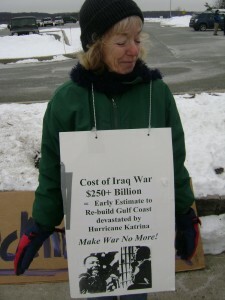 The Good Friday Stations of Justice, Peace, and Nonviolent Resistance to Lockheed Martin this year were dedicated to Mary Jo McArthur, who died just days before. It was the first time in more than three decades that Mary Jo’s name hasn’t appeared on a Brandywine Peace Community list of those arrested for peace and the works of justice. Memorial, Saturday, April 13, at 11A.M. 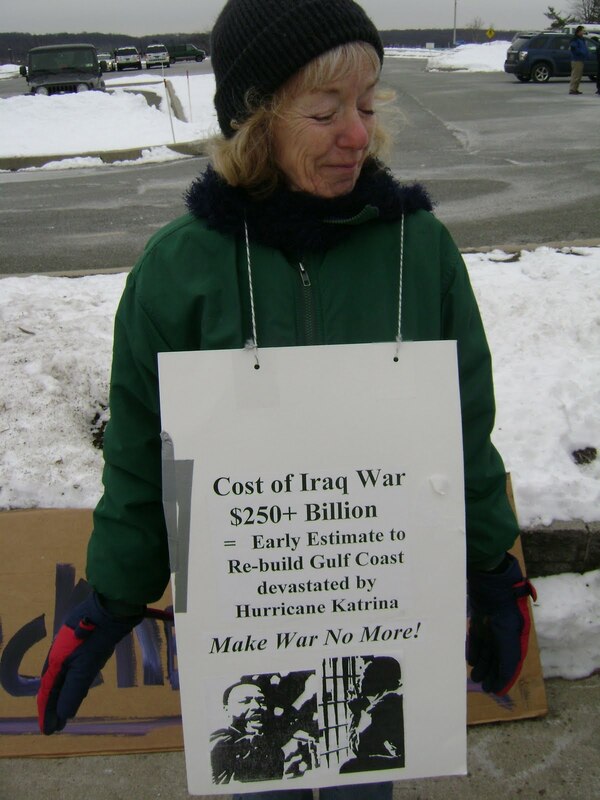 Anyone who has over the past four decades been at Lockheed Martin or elsewhere with the Brandywine Peace Community or any number of other groups from Philadelphia to Washington, DC would have seen Mary Jo McArthur — holding a sign, gripping a banner, standing, walking, getting arrested, doing what was just a matter of fact for her – quietly standing up for justice, saying her prayers, doing peace, caring about and serving others. Last Saturday, March 23, Mary Jo McArthur died. Her passing was with the same peace in which she acted over and over and over and over, again and again, without bluster, or argument, with just a matter of fact-ness that says, in effect, this is where I am, I know what happens here, and this is what I do…knowing full well what would happen. Mary Jo is still with us here today, in the prayer of St Ignatius that she said daily and she asked Bernadette Cronin-Geller to bring here today.